July 30, 2018 By This post may contain affiliate links. 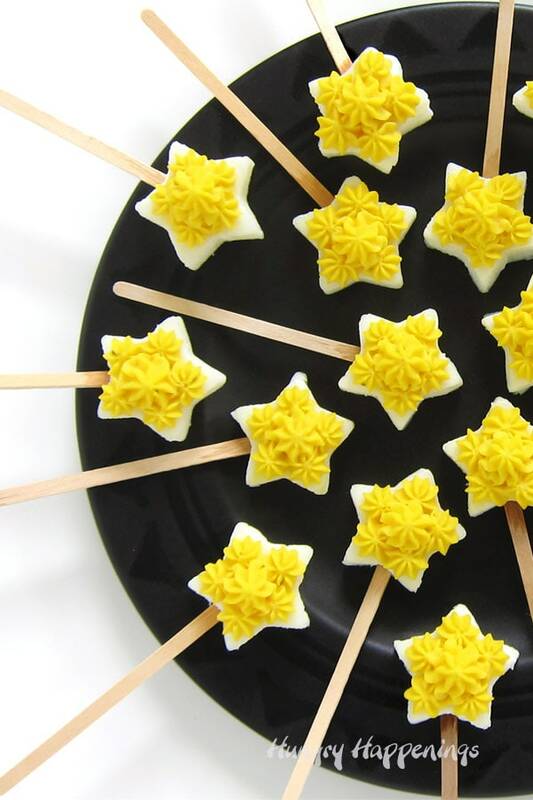 Surprise your party guests by serving these Deviled Egg Star Pops. Each bite sized, star shaped, hard boiled egg is decorated with a creamy egg yolk filling and is served on a lollipop stick. They are slippery! How many times have you gone to pick up a deviled egg and it’s slipped across the serving platter? The first bite has all the yummy filling. The second bite is plain egg white. Peeling hard boiled eggs can be challenging. These Deviled Egg Star Pops solve all these problems, plus they are just darn fun! These deviled eggs are served on a lollipop stick, so no more eggs slipping across your plate. They are bite sized so the ratio of filling to egg white is optimized. The eggs are cracked and separated before cooking, so no peeling is required. Watch this video to see how these Deviled Egg Star Pops are made then scroll down for tips and tricks and the recipe. I was inspired to experiment with some fun ways to serve deviled eggs after recently attending an Ohio Poultry Association event. I already knew eggs were a healthy source of protein and vitamin B and were low in calories, but I did not realize that with the exception of vitamin C, an egg contains all of the macro and micro nutrients to sustain human life. That’s pretty amazing. The egg white is pretty good, but the yolk is seriously where it’s at nutritionally. The egg white contains Selenium and Riboflavin, while the yolk has Choline, Vitamin B12 , Vitamin D, Vitamin A, Vitamin B6, Iron, Vitamin E, Zinc, Folate, Phosphorus, Selenium, and Riboflavin. I never was one to skip the yolk but I know some people worried about cholesterol. Well you’ll be happy to know that cholesterol is no longer a nutrient of concern. Government and health organizations have removed dietary cholesterol limits and include eggs in recommended healthy eating patterns. Eggs are also quite abundant which helps to keep them an economical choice, especially when you are feeding a crowd at a party. Making deviled eggs using the method I describe below does mean there will be some scraps of eggs that cannot be used to make Deviled Egg Star Pops, but you can easily use the scraps to make a nice egg salad for your lunch today. Start by spraying an 8 inch square pan and 4 small bowls or ramekins really well with cooking spray. If you prefer, you can butter the pan and bowls. Do NOT skip this step! The eggs will stick if you do. Then crack a single egg. It’s best to hit the egg on a flat surface (your counter top) to get a nice even crack. I like to use an egg separator, because it’s gentle and my yolks very rarely break open. You can also pour the egg into your hand and allow the whites to flow between your fingers. The yolk should remain in your hand, then you can place it in a bowl. Place the egg yolk into one of the small bowls. Stir the egg white using a fork then pour it into the prepared square pan. It’s important to stir the egg white with a fork or a small whisk in order to break up the thicker part of the egg white and to blend it with the runnier part of the white. I experimented with this recipe quite a few times, and the one time I didn’t do this, my egg whites would not cook evenly. The wetter white never cooked through. Repeat this process with 4 egg yolks per small bowl, and all 12 egg whites in the 8 inch pan. Then bake or steam in a water bath. I chose to place my 8 inch square pan into a 9×13 inch pan and bake the egg whites in the oven. I filled the larger pan with about 2 cups of boiling water, covered the pan with tin foil, and baked the egg whites for about 25 minutes at 325 degrees F.
I set the bowls of egg yolks in a 12 inch skillet filled with water that had come to a boil, then covered the skillet with a tight fitting lid, and turned the heat down to low, and allowed the yolks to heat until the egg yolks were set, also about 25 minutes. The yolks will not look pale yellow like they do in a traditional hard boiled egg. They will remain brightly colored but will get firm in about 25 minutes. This time will vary depending on how tight your skillet lid is and how your stove top heats. If using a gas range with a very tight fitting lid your yolks may be ready in about 20 minutes. If you remove the lid to check your egg yolks and the egg yolks are not firm, replace the lid, turn the heat up to medium and allow the water to heat up until bubbles begin to form, then reduce the heat to low and continue to cook. I experimented with baking the egg yolks, but they always came out a bit too rubbery. I also tried scrambling the egg yolks in a skillet, but didn’t think the texture of the eggs was like a hard boiled egg yolk. The stove top method worked best. The egg whites can be cooked on the stove top as well, but if you don’t have two 12 inch skillets you’ll have to cook the yolks and whites in two batches which will take almost an hour. By baking the whites and cooking the yolks on the skillet both will be ready in about 25 minutes. Once the egg whites are baked and are firm to the touch, remove them from the oven and water bath and let them cool in the pan for 15 minutes. Press a small star (or other shaped) cookie cutter into one corner of the egg white and cut out a star. Wiggle the cutter slightly to make sure the egg has been cut all the way through and the star moves slightly. Lift the cutter out of the pan. In some cases the egg will come out, in others it will not. Continue to cut the stars, keeping the cutter as close to the last cut as possible. You should be able to get 18-20 stars out of one pan of egg whites. For the stars that do not come out of the pan with the cutter, carefully break the egg whites around the star, then lift the star out of the pan. 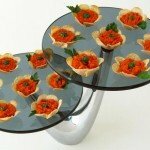 Set the stars on a silicone mat or plate. Insert a skinny craft stick or small paper lollipop stick into each star shaped egg white so that the stick goes in about 3/4’s of the way up the star. You want the stick to go in through the middle of the egg white. It’s best to insert the stick in between two of the star’s points. In order to be able to pipe the deviled egg filling using a small star piping tip it needs to be really smooth, so you will need to process the egg yolks in a food processor or blender. Then add your favorite ingredients. I’m sure you have a favorite deviled egg recipe. I personally like my deviled eggs simply made with a little Miracle Whip, but I know most people like to add some mustard, sweet relish, and salt, so I tried it. It was a bit “mustardy” for my liking but my husband loved it! The additional ingredients gave the egg yolk filling a very bright yellow color which looked nice on the deviled egg lollipops. If you add relish, be sure to really process the filling in order to get the bits of sweet pickle really chopped up well. Spoon the filling into a pastry bag fitted with a small star tip and pipe the filling onto the stars. You can also spread it on if you don’t have experience piping. Simply pipe some filling on the scraps and enjoy a snack. Cut the scraps into small pieces and stir the remaining filling with the scraps to enjoy an egg salad sandwich. You can find items needed to make these Deviled Egg Star Pops from amazon (commission earned for sales). 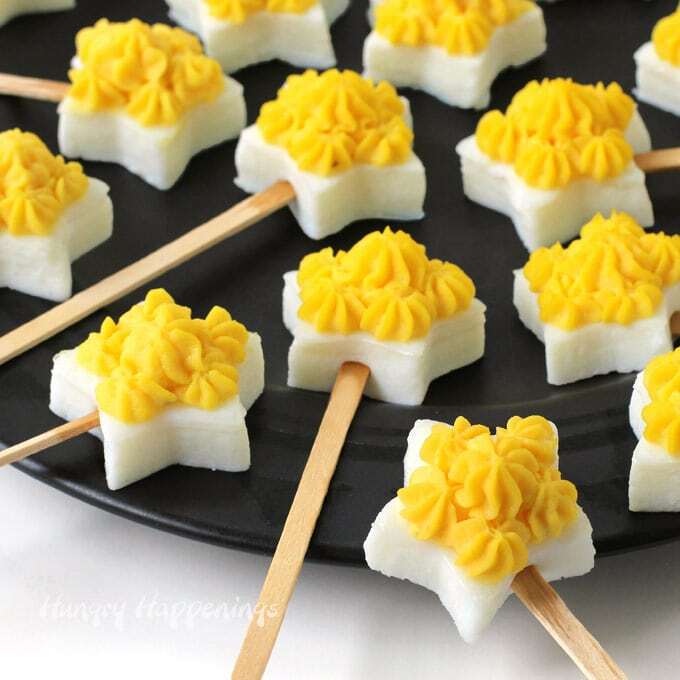 Deviled egg lollipops - star shaped egg whites are decorated with creamy egg yolk filling. Perfect appetizer for the 4th of July, Christmas, Memorial Day, a birthday, or a pot luck dinner. Spray an 8 inch square pan and 4 small bowls with baking spray. Separate eggs and pour 4 egg yolks into each of the small bowls. Whisk egg whites to break up the thicker parts then pour into the 8 inch pan. Set pan in a 9x13 inch baking dish. Pour about 2 cups of boiling water into the 9x13 baking dish, being careful no water spills into the egg whites. Cover the pan tightly with tin foil and bake for about 25 minutes until the egg whites are firm. Meanwhile, heat about 1/2 of an inch of water in a 12 inch skillet set over high heat until boiling. Carefully place the 4 small bowls of egg yolks into the boiling water. Reduce the heat to low and cover the skillet with a tight fitting lid. Cook for about 25 minutes until the egg yolks are firm. Remove the bowls from the water bath and let cool for about 15 minutes. Remove the egg whites from the oven and it's water bath and allow to cool for 15 minutes. Use a small star shaped cookie cutter to cut out stars from the pan of egg whites. 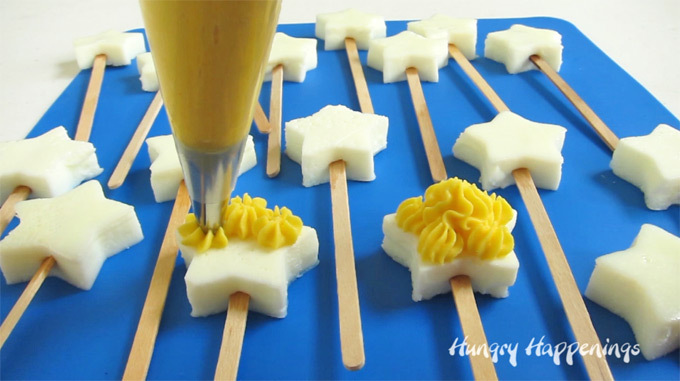 Insert lollipop sticks into the star shaped egg whites. Place the egg yolks in a food process. Pulse until the eggs are finely chopped. Add Miracle Whip or Mayo, mustard, and relish and pulse until the mixture is really smooth and creamy. Taste, then season with salt, and pepper or paprika if using. Spoon into a pastry bag fitted with a star tip. Pipe five small stars on top of the egg white star, on each of the 5 tips, and one in the center. Have fun making these Deviled Egg Star Pops for your party to celebrate the 4th of July, Memorial Day, Labor Day, Flag Day, Christmas, New Years Eve, or a birthday. They are perfect snacks to bring to a pot luck or back yard barbecue too. 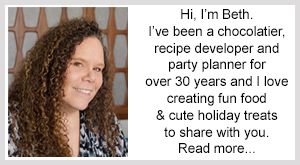 If you make them and share pictures online be sure to link to this recipe post, mention Hungry Happenings, and use #hungryhappenings. That is such a great idea! Particularly for those (me!) who hate peeling hard boiled eggs. I can’t wait to try this out! You have such a creative mind! Thanks, Sharaden. I love not having to peel the eggs. Whaaaaat!? These are super cute and fun! I can’t wait to try these! I hope your family and friends enjoy them! How cool are those!?! 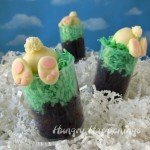 Such a fun way to enjoy deviled eggs! Holy cow these look amazing!! They make great appetizers for parties. I served them this weekend, and it was so fun to see my guest’s reaction. Oh my goodness, this has got to be the most creative thing I’ve seen with hard-boiled eggs, love it! Thanks, Kimberly. It took a while to figure out the exact process but I can’t wait to try out more fun ideas with eggs. Oh my goodness! These are so dang cute! Perfect for a princess party! I hadn’t thought about princess parties. Thanks for the great suggestion. 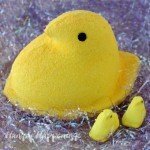 These are just so cute and so simple too! So much fun, I can just imagine all the possibilities!! I know! 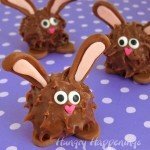 I can’t wait to make these again for a holiday. 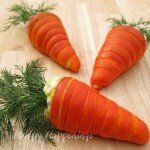 Good way to get your kids to eat their eggs! 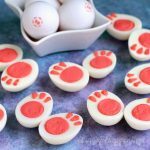 Yep, even picky eaters might snack on these cute deviled eggs! I couldn’t find a mold that was just the right size so I used the cookie cutter. I like that they are bite sized. I also enjoyed all the egg scraps. I just made some egg salad sandwiches. Loving these adorable star deviled eggs! Your recipe says 12 eggs with 4 yolks placed into 4 bowls which actually means 16 eggs. Which is correct? Im making them now and need to know please. I am so sorry about that misprint. You will need 16 eggs so you have 4 yolks in the 4 bowls. I hope you were able to make it work. Enjoy!